Many people are currently outraged at the England Football manager Sam Allardyce, who was recently caught on camera in a Daily Telegraph sting. Mr Allardyce for a fee told foreign business men (who in actual fact were undercover reporters) how to get around the FA player transfer rules. However, corruption in English Football is nothing new. It can be found rearing its ugly head as far back as 1960. 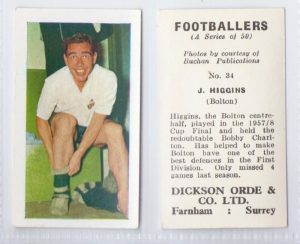 It was reported in the Daily Express that a Bolton Wanderers player, centre-half John Higgins, had been asked at half time if he would make sure they lost their match against Manchester City, who would be relegated if they were to lose. The man said he would give him £200 if he accepted (the equivalent of £4,201.06 in 2016). It may not seem a lot now but you have to bear in mind that England’s top players had wages of no more than £20 the equivalent of £420 today. However, Mr. Higgins refused to accept it and instead informed the Football League who in turn convened a meeting on the 12th of October of that year to discuss it and other bribery allegations. 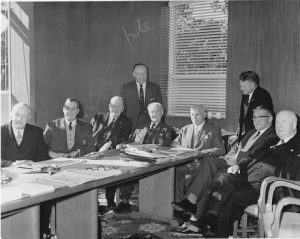 12th October 1960 – Meeting of the Football League to discuss corruption in the game @ St Annes On Sea FL offices. It was thought that a group of crooked bookmakers in the Manchester area were responsible, who also had connections with a massive horse doping ring, with most of their football centric activities being focused around the Manchester, Swansea and London areas. It seems clear to me as football continues to be governed by big money and not by the fans it will always attract these types of people. Amazingly the player, who was on far less money than Mr Allardyce, after being approached, laughed at the suggestion and reported the incident. He obviously thought more of the game, the fans and his fellow players of doing such a thing.